Watching Al Roker talk about the history of art and illusion makes as much sense as attending a nuclear physics lecture by Ronald McDonald. Not to be a “Roker-hater” but the man dorks the hell out of this presentation which is otherwise really interesting and at times downright fascinating- I’ll watch him do weather or make ribs, but leave the wonders of art history alone, Al. So aside from the unbelievably corny Roker-vision, this 50 minute look into the history of optical illusion in art, architecture, and sculpture by the National Gallery of Art in Washington is as informative as it is cool. There are some visuals that go on too long, an excessive use of 3D wireframes, and enough epic, heavenly music to make you consider hell as an option but the look into anamorphic paintings, tricks with scale, and multiple-point perspective are well worth it. 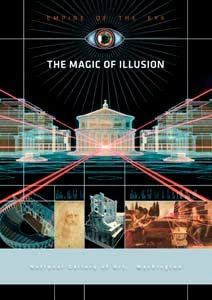 The documentary highlights interesting works by artists like: DaVinci, Holbein the Younger, and the lesser known but equally impressive Masaccio and Francesco Borromini and it does a good job in illustrating how the illusions work. For good measure, the film covers modern usage of optical illusions by using a clip from Casablanca and in everyone’s favorite use of forced perspective in Disney’s Cinderella’s Castle as well. The DVD is a must have for art teachers, stoners, and Al Roker’s family but it’s an enlightening experience for anyone interested in art or visual trickery.